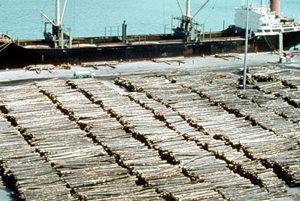 Logs at port to be loaded for export. The aim for containment operations is to restrict further spread rather than reducing the numbers of ants at a site, although the two are not mutually exclusive and a severely reduced population of ants will reduce their capacity to spread. There are two facets to the containment of Argentine ants: restriction of natural spread and reducing the risk of jump dispersal. The rate of natural spread of Argentine ants is generally no more than 150 m per year. In comparison with many other animal pests that are able to spread themselves at a rate of tens or hundreds of kilometres a year, Argentine ants should present unusually good opportunities for containment. In urban and suburban environments, the movement of Argentine ants is often slowed or partially restricted by roads (which represent wide, harsh and barren zones for ants), which is why the boundaries of infestations in human environments are often marked by a road edge. This represents a potential opportunity for containment as infestations will typically be surrounded by strips of grass, footpaths and concrete road verges that can be treated with a combination of residual surface sprays and granules where appropriate, to further hold the invasion line. The timing of such operations would be a critical part of success and treatment barriers need to be in place during the time of significant spread over spring and summer. The most threatening form of spread of Argentine ants is via jump-dispersal, which is usually associated with human transport. It can also occur naturally as a result of flooding, when debris containing colonies of Argentine ants is washed downstream. Although Argentine ants do not colonise wet/boggy ground, they will readily survive temporary submersion under water, so infestations on the margins of rivers and streams are a genuine threat for being dispersed downstream. However, human-mediated dispersal is by far the most significant concern. Secondary pathways are things like trailers, boats and vehicles themselves, which can sometimes house Argentine ant colonies. This is more likely if they are left parked outside for extended periods or they contain rubbish or food scraps. Pathways for jump-dispersal can be from specific high-risk sites (e.g. commercial transport depots and plant nurseries) or from non-site-specific activities (e.g. scraping and clearance of roadside debris, sharing of plants between friends). In the case of specific high-risk sites, one option is to eliminate the threat through intensive ant control at the site. Intensive baiting followed by targeted surface and ground treatments should be able to remove ants from a specific site, and the challenge becomes one of keeping them out if the site is part of a larger infestation. Surface treatments could have an important role here, along with regular monitoring for ants and follow-up treatment if required. Ideally, the landholders themselves will be responsible for keeping ants away from high-risk activities, so education and communication will be an important aspect of managing these sites. If the activities on site are regarded as very high risk, there is a case for authorities to provide direct assistance in eliminating Argentine ants from the immediate area and asking them to maintain a regular programme of control at the edges to prevent reinvasion. In the case of non-site-specific activities the key will clearly be in communicating risks to those undertaking the activities and educating them in steps they can take to minimise the risk of transporting Argentine ants to new areas. Those people undertaking high-risk activities across a range of sites need to be aware of which areas are likely to contain Argentine ants and to keep an eye out for ant activity amongst debris or materials being carted out of those areas. In the case such ant activity is observed, even the direct application of fly spray may be sufficient to eliminate the threat in cases where ants are seen in a discrete piece of material. For larger infestations amongst large amounts of material, it would be advisable to employ the services of a pest control professional. However, it can be assured that some level of human-mediated dispersal will continue and new infestations will appear, even in districts with good containment policies. Some of these new infestations could well have been seeded from different regions or may have been present for a number of years before their numbers reach readily detectable levels.